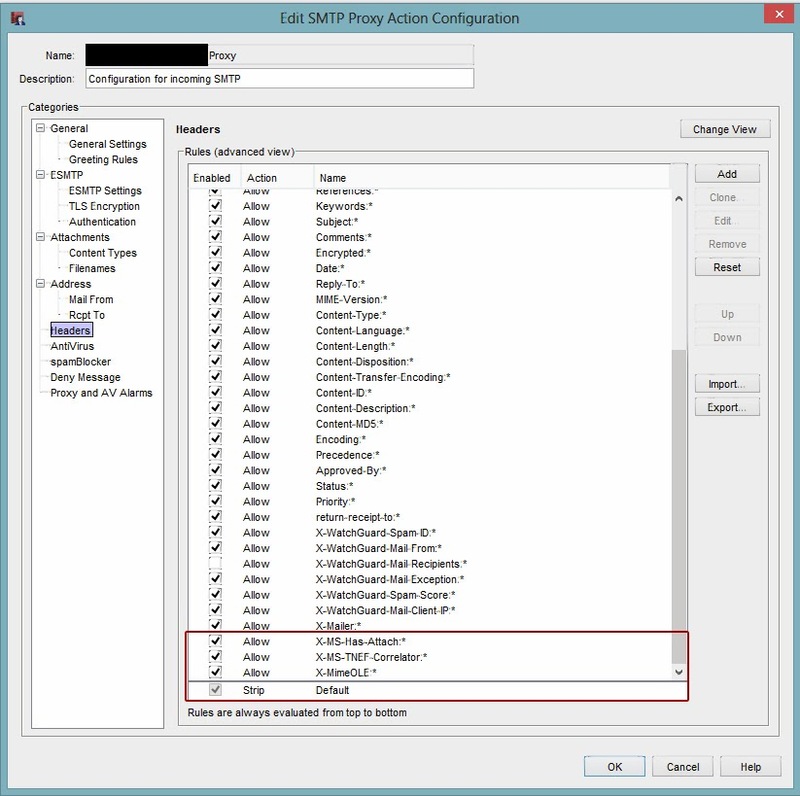 We recently ran in to this issue with a client running watch-guard SMTP proxy with an exchange server sitting behind it. Watchguard that protects your network has detected a message that may not be safe. Action: The Firebox deleted winmail.dat. As you can imagine affected users were quite pissed off about this and i don't blame them. When users of Microsoft Outlook send email in Rich Text format, Rich Text format email messagess are TNEF encoded. This encoding type stores all attachments and formatting information in a file named winmail.dat. The SMTP-proxy on your XTM device strips some of the headers out of the email that identify it as a Rich Text formatted email. If the email client does not have the header information needed to interpret the winmail.dat attachment, the email client cannot display the proper formatting of the email, and incorrectly displays the attachment as a winmail.dat file. In the Pattern text box, type winmail.dat and Set action to allow or AV scan. Thanks! I had this question for months but was too lazy to Google.